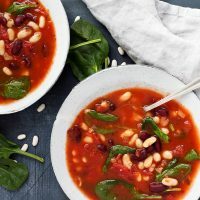 If you’re anything like me, you are probably looking for a little balance after all the Super Bowl Sunday indulgences :) This Two Bean Tomato Spinach Soup is just the thing! It’s everything I’m needing right now – easy, delicious, hearty and healthy. 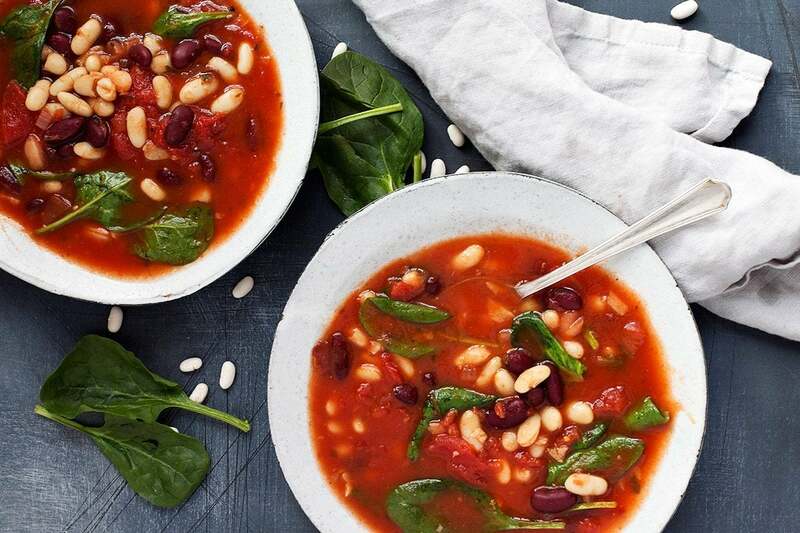 This soup has a rich tomato broth, combined with both red and white kidney beans and a healthy amount of baby spinach. It’s a great soup to have in the fridge for a bowl at lunch. 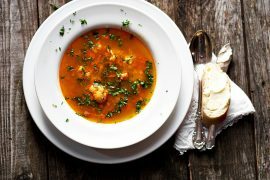 Add a loaf of crusty bread and a salad and this is a great dinner soup, too. You can make this bean soup quickly, using canned beans or if you prefer, start with dried beans. Either way, you’ll enjoy a hearty and healthy bowl of soup to bring a little balance to the week. Bringing out the full flavour of the tomatoes is the key to this soup. Taking the time to caramelize them at the beginning will really pay off at the end. Alternately, for a speedier soup, start with a can of Fire-Roasted tomatoes. Feel free to replace the baby spinach with another green. Chard or kale would be great alternatives. Change it Up! If you’re feeling like a change of flavours, switch out the Italian-style herbs in this soup with a Tex-Mex mix. Use a bit of cumin, chili powder and/or paprika, to taste. If you started with dried beans and cooked them off, save a bit (about a cup) of the bean cooking liquid to add to the soup, for extra flavour and thickness. 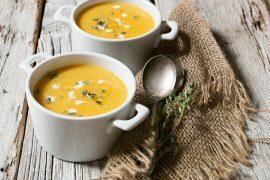 You can replace a cup of the chicken or vegetable broth or simply add additionally, depending on the thickness of your soup. If starting with canned beans, be sure to rinse well with cold water before using. You’ll remove a lot of the added salt by doing this simple step. As with all soups, seasoning is key. If soup seems to lack enough flavour, it probably needs more salt to bring out all the flavours. Soak dried beans 6-8 hours or overnight in water. Drain and add beans to a large pot. Cover beans with water to about 2-inches above the beans. *For flavour, you can add a bay leaf, quartered onion and or halved garlic cloves, but do not salt the water or your beans might be tough. Bring water to a boil, then reduce heat to medium-low or whatever heat level allows the water to just barely simmer. Cook, stirring once or twice for 45-60 minutes, or until beans are soft and creamy. Drain and remove and discard bay leaf etc, if using. Use beans right away for your dish or refrigerate to use later. 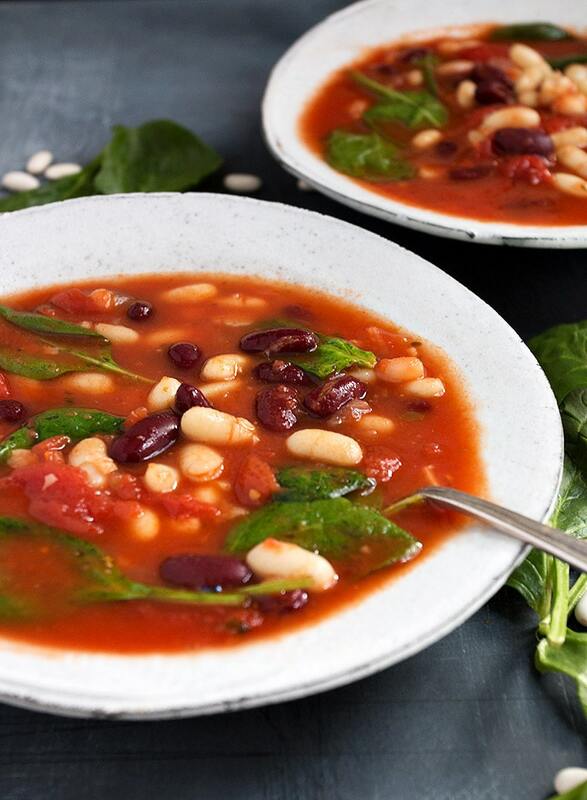 Rich tomato broth with red and white kidney beans and spinach. Heat 2 Tbsp. oil in a large heavy pot over medium-high. Drain tomatoes, reserving the liquid to use later. Add the tomatoes, red pepper flakes and a pinch of salt to the pot. Stir to combine, then allow to cook, undisturbed, until caramelized and browning in spots, about 5 minutes. Break up tomatoes, scraping bottom of pot, and continue to cook, scraping and stirring occasionally, until tomatoes are caramelized all over, about 5 minutes more. Transfer tomatoes to a plate. Heat another 2 Tbsp. oil in same pot over medium heat. Add onion, garlic, and a pinch more red pepper flakes, if you like. Cook, stirring often, until vegetables are soft and starting to brown around edges, 8-10 minutes. Stir in vinegar and caramelized tomatoes, scraping up browned bits. Add broth, beans, vinegar, dried herbs, reserved tomato juice and Parmesan rind (if using) to the pot. Bring to a simmer. Cook until flavors meld, about 30–45 minutes. Taste soup and season with salt and pepper, as needed. Just before serving, stir in spinach and pesto, if using and cook until spinach is just wilted. Serve. 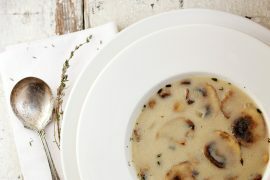 See Cook's Notes for how to start this soup with dried beans instead, as well as other tips for making this soup! Delicious soup! The photos definitely attracted me to this recipe. There are a few parts that are confusing about the recipe. For example, it doesn’t mention that you need 2 sets of onions, it says to add vinegar twice and there’s no mention of what to do with the liquid from the tomatoes. I had a can of tomatoes that was is more of a crushed tomato sauce so I just added it back and reduced the broth to give it a bit more of a tomato punch! Doesn’t take away from the recipe though! Great quick supper! So glad you enjoyed it and thanks for pointing out the confusion in the instructions. I have fixed it now :) Thanks! Looks delicious Jennifer. Love the added parmesan rind for extra flavor. Will be adding this to our soup rotation! I’ve been looking for a recipe just like this – so thanks so much Jennifer! I’ll be serving this one up soon :) I bet all the flavors really shine. That color alone is enough to make me crave this gorgeous soup! 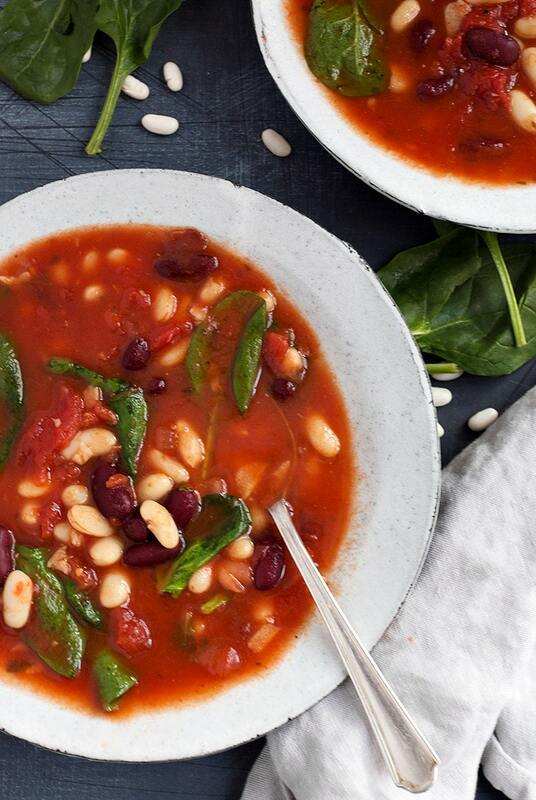 Who would have thought beans and spinach could look so good? Thanks for the tips on cooking dried beans!